Hi and welcome! Today's card comes with a video! Normally when I make a video I have to do it well in advance of when my post goes live to allow time for editing, voiceover, etc. 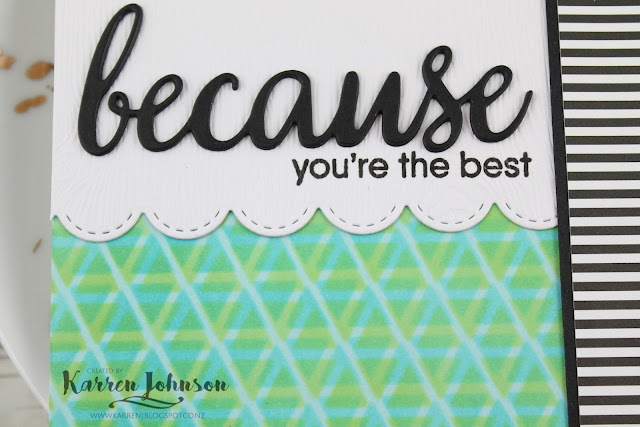 But today, I decided to film as I made this card for the latest sketch challenge at MFT, as well as the color challenge at Color Throwdown and the stencil challenge at Simon Says Stamp. The sketch put me in mind of a color-blocked card so that pretty much the direction I took - or at least I started in! I took a piece of Berrylicious cardstock and the Geometric Grid stencil and sponged over it with Audrey Blue ink. Once that was finished, it still looked flat to me, so I moved the stencil slightly and added some Apple Green ink over the top. Much better! The white panel is a woodgrain cardstock that I die-cut with a Stitched Scallop Edge die. 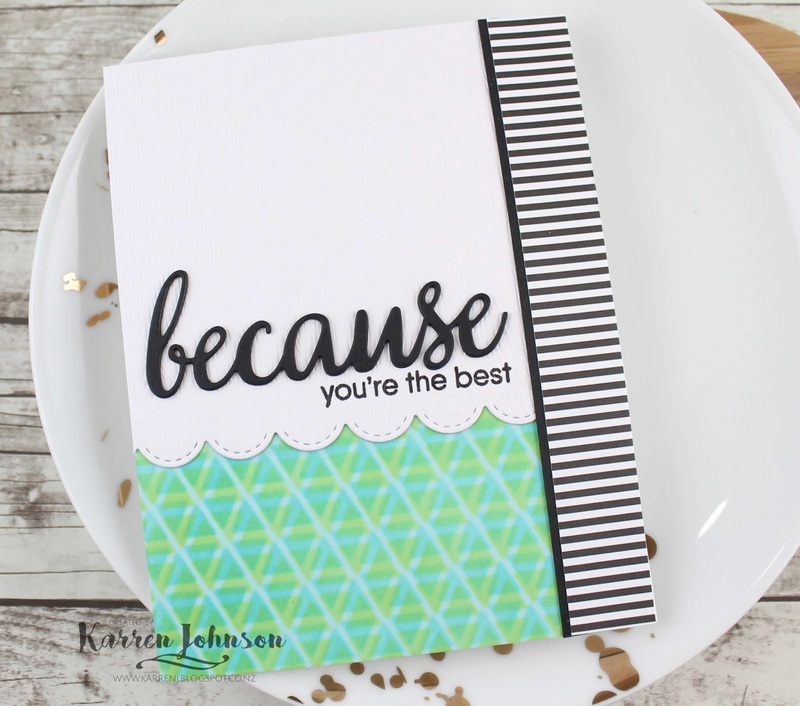 I stamped the sentiment several times to get a good impression and then adhered the panel along with the stenciled piece to a white top-fold card base. After a lot of to-ing and fro-ing about what to put down the right hand side (I started with lime gingham paper, then went to black cardstock, then to Berrylicious and finally to the black & white striped paper) I added the stacked "because" and at last finished the card! No embellishments because this card would suit a male or female equally. Thanks so much for visiting. You can watch the video below or over at YouTube. Fabulous, love how you added the extra colour to the stencilled panel. Actually I love how you explain how you decide on each step. Its wonderful and clear. I love how you added a pop of color with your stenciling, Karren! 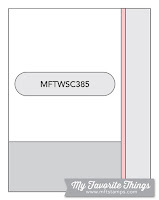 Clever idea to do the offset technique, too! Very pretty card and great job combining challenges! Those gorgeous stripes were the perfect choice, Karren! Wonderful how-to video! Great use of patterns! Love this card! Thanks so much for playing along in the Color Throwdown challenge this week! Wonderful card Karren! The colours and design are really striking.